- Pinnable e-mail folders, which – straightforward as it sounds – will allow you to pin a folder to the start screen for quick access. RSS feeds or emails from a specific person are just one example for the possible use. 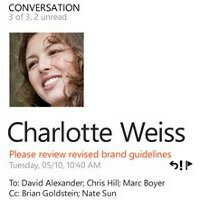 - Conversation view in e-mail, which is your typically useful threaded e-mail view. - Server search, which grants you access to those long forgotten emails, which are still stored in the depths of an Exchange server. - Lync, which lets you stay in touch with co-workers and have access to company-specific services. - Complex password, which gives you the option to type in an alphanumeric password. - Information Rights Management, which translates into better protection for documents. - Support for Hidden SSID or access to hidden Wi-Fi networks. - Office 365 and Windows Live SkyDrive documents save, share and sync. Folks from WinRumors have captured some live footage of the features demoed at TechEd, so check out the video below to get a sense of the direction of WP7. May 24th is the date when Redmond is hosting an event about the mobile platform, so stay tuned!